Note from shop owner Adrift is off for holiday. We will be back in May! Adrift is off for holiday. We will be back in May! Thanks! This was sent as a gift and well loved. Jen went above and beyond to make a wreath for me to bring to NY before Xmas. She even hand-delivered it since we live in the same area. It was beautifully packaged and was the perfect gift. Now I need one! CUSTOM listing for Monica: 1 Rose Gold Wreath 18"
NEW! 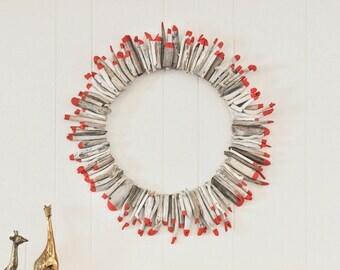 Fall and holiday wreaths made of driftwood are now available in red, green, gold, rose gold and more! Choose 16" or 24". Perfect for front doors, mantels or any interior wall. Setting goals gives you something to shoot for. Displaying those goals keeps them top of mind. Hang this hand lettered quote banner anywhere you need a reminder to keep chasing what makes you feel ALIVE! It takes over 4 hours to collect the driftwood, lay out the design, adhere the pieces and paint the tips of the wreaths. I'm Jen, a designer and maker on the side of a fun life. I think bright botanicals like this air plant look so pretty against faded driftwood for a bouquet alternative. For these necklace holders, I like to choose a paint color that pairs well with the driftwood and copper nails. Adrift uses gathered Northern California driftwood to create one-of-a-kind handmade home goods and gifts. I'm Jen, a maker from the coast of Northern California. I comb local beaches for unique driftwood that forms the base for my handmade home goods. For beach houses or cabins and everything in between, my pieces are unique, simple and beautiful. Hello lovers of the beach, wood, shopping small and buy handmade! In this shop you'll find locally gathered driftwood and locally sourced materials, all made with my two hands in my tiny mountain cottage studio in Northern California. Quality is guaranteed so if you have concerns about your order, simply let me know and we will figure out together how to take care of things. Not happy with your order? Simply send me a message and we will work together to take care of things. Funds must be received before an item can ship. Thank you for your understanding, and for supporting small makers like myself. Shipping is handled by the United States Postal Service and sent Priority or First Class Mail insured. The tracking number will be provided to you on the day the order ships. Any item in the shop can be purchase for wholesale. Please send me a message if you are interested. Looking for a display piece to use in your shop, photo shoot, wedding or window display? Custom and contract work is available! Please send me a message if you are interested.